$1/4 Minute Maid Coupon Available Again for Possible Money Maker! 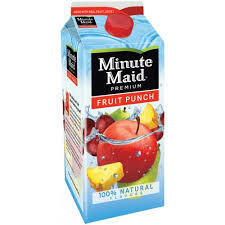 The $1/4 Minute Maid fruit drink or lemonade (59 fl oz) coupon is available again! You can also get a $5 Walmart eGift card when you buy four Minute Maid juices through 9/7/14! To get your rebate, star the qualifying items on your receipt and then take a photo of your entire receipt and text it to 811811 along with the words “Minute Maid” for validation. You’ll then get a text back with a code valid for a $5 Walmart e-gift card. Combined with the new coupon, this could mean a money maker for you! Remember, you can usually get two prints from each coupon. To get a second print, just come back to this page and click on the coupons you want again. It’ll save you some time and frustration searching, and each one will open in a new tab. *NEW* $2 Prilosec Coupon + Deals!